The WPT India 2018 is less than two weeks away and almost every fan of live tournament poker has already braced for the quality poker action and immense thrill. The 2018 edition of the major series is set to take place at the luxurious floating casino – Deltin Royale anchored in serene River Mandovi. The upcoming WPT India has something for everyone. 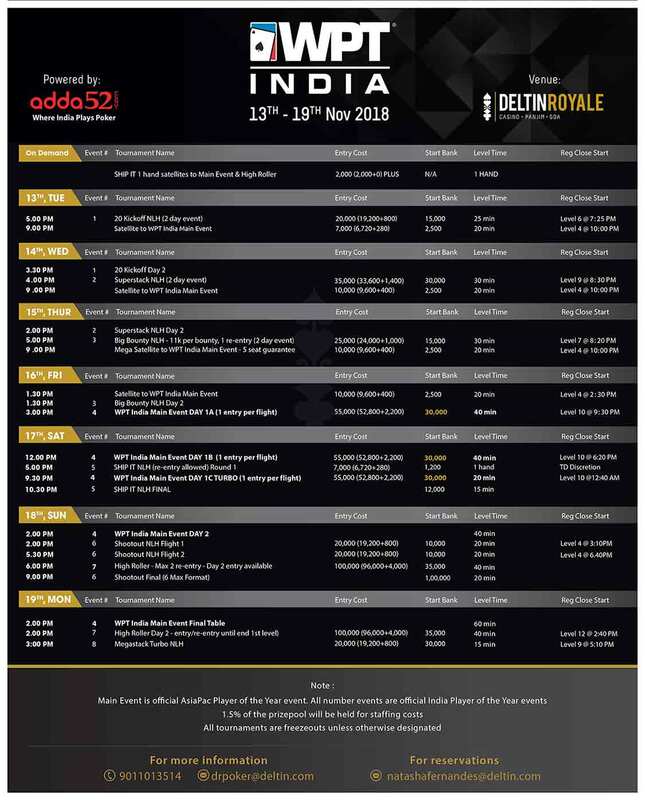 It features a total of 8 exciting events with buy-ins ranging from INR 7K to INR 55K for Main Event and INR 100K for High Roller tournament. The headline tournament is, of course, the 55K Main Event, which is scheduled to take place from 16th to 19th November and it is expected to attract even bigger field this time. Last year, the event drew a record-breaking participation with 527 entries, which included several international pros. The Main Event Day 1A runs on 16th November (Friday), while the action for Day 1B and Day 1C happens on 17th November (Saturday). Each of the starting flights has a good deepstack structure with a starting stack of 30,000 and 40-minute levels for Day 1A and Day 1B. Day 2 on 18th November also features 40-minute levels but the final table on 19th November will have 60 minute levels. For high roller lovers, the series promises 100K High Roller, a two-day action-packed re-entry event taking place from 18th to 19th November and featuring a starting stack of 35k and 40-minute levels. That is not all, there are several other exciting events on the schedule. One of them is the opening event – 20K Kickoff NLH, a 2-day event from 13th to 14th November featuring 15k starting stack and 25-minute levels. This event is followed by a 35K Superstack NLH featuring 30K starting stack and running from 14th to 15th November. Another interesting event is 25K Big Bounty NLH, a two-day tournament for the bounty lovers, which is scheduled to take place from 15th to 16th November. The 17th November brings the 7K SHIP IT NLH event, which will be running in parallel with the Main Event Day 1B and Day 1C. The Ship IT tourney will be followed by a brand new tournament ‘Shootout NLH’ on 18th November, which will for sure enhance the experience of players. Finally, the series will conclude on 19th November with a 20K Turbo, which features 30K starting stack. The 55K WPT India Main Event took place from 10th to 13th November 2017 and it was Mumbai’s Vikash Mantri who topped the record-breaking field of 527 entries to win a hefty INR 60,30,000. Mantri started the final table as the chip leader in this event and kept his lead for the major part, eventually beating Arjun Arora in heads-up. Arora pocketed INR 39,47,000 for his efforts. It was not the first live cash for Mantri, as he had also finished 4th in DPT Main Event November 2016. Taking place from 9th to 10th November was the 100K High Roller, which drew a total of 148 runners. The freeze-out event played out over 2 days found a champion in Rajnish Kumar from Patna, who defeated a tough opponent Rajesh Rajpopat in heads-up to take home INR 24,49,000. The High Roller win gave Kumar his career- best live cash. A high-stakes cash game player, Kumar has been almost regular at Goa tournaments. The same year, he had also won DPT High Roller event. The second event on WPT India schedule was the 30K SuperStack, a re-entry event, which ran from 8th to 9th November. It drew 284 entries and it was Sandeep Tulsyan who had won the event after beating the popular pro Abhishek Jalan in heads-up. Tulsyan took home INR 19,00,000, while Jalan settled for INR 12,53,000. While Tulsyan had made several deep runs in DPT tournaments and other prestigious events taking place in India, his win in the Superstack NLH was by far his best live cash. The opening event 20K Kickoff NLH drew a total of an impressive 195 entries to create prize pool of INR 36,87,840, which was shared by the top 22 players. The lion’s share went to the Mumbai-based pro – Kanishka Samant who won the title for a hefty INR 9,12,000 in the top prize money. Kanishka is no stranger to live poker tournaments. He has notched several notable scores across domestic as well as international poker events such as DPT, WPT India, APT, APPT and several other events. Sameer Tavanandi took down the WPT India Bounty NLH, a 2-day event that ran from 12th to 13th November. The player beat a strong field of 128 runners to take home INR 5.47 lac for his 1st place finish in the tournament, after beating the popular pro Eka Vedantham in heads-up. Hailing from Mumbai, Sameer is also a well-known pro on domestic circuit with several deep runs in Deltin Poker Tournament (DPT) events. This victory at WPT India Bounty NLH had given his career’s best live cash. 12th November saw the PLO enthusiasts competing in the 20K PLO event, which drew 86 entries. Outlasting the strong field in this event was the young gun Deepak Bothra who took the title for INR 4.88 Lac. Hailing from Pune, Bothra is no stranger to live tournaments. While he has notched up several notable scores at Deltin Poker Tournament (DPT) events, this win was best live score so far. Closing out the inaugural WPT India 2017 was the 20K Deep Turbo NLH where it was Rahul Melwani from Bangalore, who outlasted a field of 111 entries to take home INR 4.20 Lac in top prize money. He beat Rajat Sharma in heads-up who settled for INR 3.20 Lac for his remarkable runner-up finish. For Melwani, this win gave his career’s best live cash in 2017. He surpassed this score this year by finishing 16th in the HK$ 18,000 NLH – Main Event at Doupai Cup Main Event, Macau. The WPT India 2017 also had a unique event INR 7K SHP IT NLH on its schedule. The event that took place on 11th November found a winner in Neeta Banker who defeated the well-known poker pro Abhishek Jalan in heads-up to earn INR 1.32 Lac. Neeta is a recreational poker player who travels to various parts of India to compete in tournaments and cash games. For Jalan, it was the second runner-up finish at the series as he had also finished second in SuperStack NLH for INR 12.53 Lac.